Canstar Agribusiness Award is awarded to the institution that provides an outstanding value combination of products to agribusiness customers, as well as excelling in a range of institutional factors. The award aims to give recognition to the institution that backs up quality products with great service to the agribusiness sector. Natural disasters can take their toll on rural businesses, so it pays to know what support is available from financial institutions. 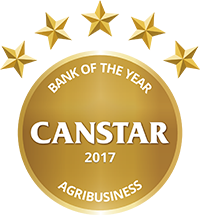 ANZ wins CANSTAR’s 2017 Bank of the Year – Agribusiness. Read about how ANZ supports generations of farmers here.